With the advent of the digital economy, the impacts of information technologies on business models, value chain activities and products and services are becoming even more strategic. As digital giants such as Apple, Google, Facebook, Amazon and Netflix disrupt industries, established and new firms are making digital transformation the highest priority on their executive leadership agenda. Chief Information Officers (CIOs) and IT Directors are witnessing a dramatic transformation in their roles as strategy catalysts and stewards of their organization’s digital transformation strategies. This three-day program is a comprehensive experience for senior IS executives (including CIOs, VPs of key IS functions – CTOs and IT Directors) to increase their knowledge and skills about how to be effective executive leaders. The program will include frameworks, action plans, and best practices for digital transformation across a wide variety of industries. The sessions will be highly interactive and comprise of limited lectures (to present new frameworks), case discussions, breakout projects and action learning, whereby participants will have the opportunity to apply the new knowledge within their own organization. How are digital technologies impacting competitive strategy? What is the competitive landscape in a digital economy? What are the emerging roles of the CIO and IT Director in the digital economy? Why is competitive positioning important? How do competitive forces affect a firm’s strategy? What are the alternative competitive positions? Why are resources and capabilities important to competitive strategy? What are the differences between resources and capabilities? How should digital technologies be utilized as competitive resources and capabilities? What are the strategic roles of IT? How can you identify opportunities for enhancing business model execution through IT? What is your firm’s business model? How are you leveraging IT in your business model? How can digital technologies be leveraged for business model innovation? What is the new economics of information? What are the new rules of digital transformation and competitive strategy? What are the platform business models? What are the rules of platform model competition? Why are digital technologies likely to disrupt industries? How should business models be redesigned to address digital disruptions? How will you transform your firm’s business model through digitization? What platform model opportunities or threats do you sense to your firm’s business model? How should CIOs design their business and IT governance strategy? What governance structures and processes should be considered in the design of governance models? What are the emerging organizational models for nurturing digital innovation? How should CIOs facilitate partnerships with their business peers and CEOs? How should CIOs structure their metrics portfolios and communication strategies with business executives and CEOs? What are the challenges in developing compelling business cases? What are the alternative approaches toward business cases? How should compelling business cases be developed? What are the change management challenges in digital transformations? What are the best practices for successfully leading digital transformations? 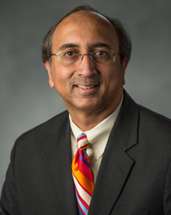 Dr Vallabh Sambamurthy (Michigan State University) is the Eli Broad Professor and Associate Dean of Outreach and Engagement. He was the Chair of the Department of Accounting and Information Systems between 2012-17. He has previously served at the business schools at The University of Maryland and The Florida State University. He was associated with the successful launch of the top-10 MS program in Business Analytics at the Broad College. He is a leading global expert on how firms compete in the digital economy. He has also been awarded the John D. and Dortha J. Withrow Endowed Teacher Scholar Award by the Broad College and the Excellence in Research awards by the Accounting and Information Systems Department. Recently, he received the William Beal Distinguished Faculty Award, the highest honor accorded by Michigan State University in 2014. Dr Sambamurthy teaches courses related to the digital business strategies and innovation in the Full Time MBA program. He has been actively involved in executive education on current topics such as the shaping of digital business transformations, strategic alignment of IT, and the management of IT innovation in firms. He has worked as a researcher or a consultant with several Fortune 500 firms including AstraZenneca, 3M, General Dynamics, Owens Corning, Intel, Bell Atlantic, Freddie Mac, and BellSouth. His recently co-authored book, titled, Guiding the Digital Business Transformations: An Executive Agenda, provides actionable frameworks for achieving competitive advantage from information technologies. He is actively engaged with business executives and academics in China, Taiwan, Singapore, India, and Hong Kong in research, teaching, consulting, and executive education activities.